Isabella: If one more person calls me the perfect princess, I’m going to punch them in the face. Preferably with my knuckles loaded with diamonds. I’m not. Perfect, that is. That’s why I stole the necklace in the first place. I wish my family and friends would open their eyes and see the real me. Love me no matter what. But no one’s ever really looked. Until Marco. Tall, dark and far more dangerous than is good for any woman to wrap her eager body around. Especially a princess who is always expected to do the right thing. But then, I’m not perfect. Never was. Never will be. What’s a girl to do? My reputation is at stake, so that’s what I’m going to do. Stake it. Right through the heart. And Marco’s going to help me achieve that. 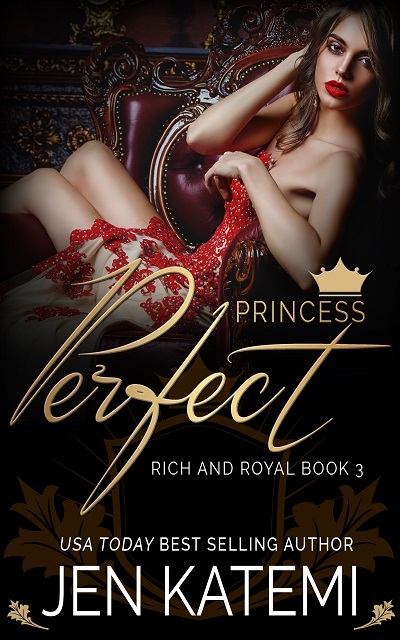 PRINCESS PERFECT is the third book in Jen Katemi’s RICH & ROYAL series about the royals of Leonioro. Each story is designed as a stand-alone, and this series can be read in any order. If you’d like to be notified as soon as this title becomes available for release, please sign up to Jen’s newsletter or follow her blog. See where it all began with King Kasper and Queen Eleni. Read more about SEDUCING HER PRINCE, the first book in the RICH & ROYAL series, here. Want to find out if bad boy prince Davide has any chance of redemption? Read more in Book 2 – PROTECT AND OBEY. Buy a copy here.